Take these factors into consideration: Does your fragrance complement your outfit? Think of perfume as an accessory – like a necklace or a great pair of shoes. Scent is very closely connected to memory and mood, so keep that in mind before you apply. 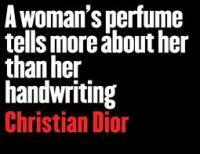 (For instance, a yellow sundress pairs very nicely with a citrus fragrance.) Some scents work better in different seasons. Take the time of year into consideration as you choose a perfume. The change of the season is a great cue for changing your fragrance. Consider what you are doing also - fragrances should suit the occasion. Daytime scents should be on the lighter side, and evening scents should be a bit bolder.